Increasing your competitive advantage with higher throughput, more diverse formulations, and assured product quality. To compete in today’s lube oil market the customer needs to manufacture an increasing amount of formulations with increased complexity and do this on-time, at-spec, every-time. Technics has developed a variety of processes, equipment, and software to enable our customers to compete at the highest level. 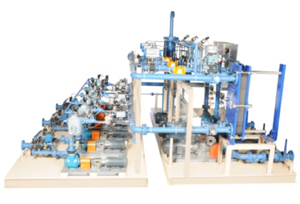 Technics has the capability to provide full EPC services for lube plants worldwide. We also work as just a part of the team focusing on any or all of the critical tasks such as Process Design, Plant Layout and Piping, Packaged Processing Skids & Blending Vessels, Instrumentation & Control Systems, and Facilities & Process Management Software. Technics designs and builds prepackaged systems for both batch and continuous inline blending. 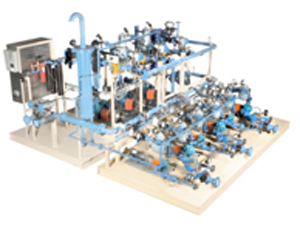 These processes must handle a wide array of materials each with wide ranging flow rates, viscosities, and temperatures. Add this to the high likelihood of damaged product due to cross contamination and you can see just how critical proper design and fabrication is. Technics has experience with every form of valving, metering, and instrumentation and will utilize the best fit for each application. Technics’ control systems utilize the CompactRIO. More sophisticated and robust than an average PLC, this system is embedded with the LOGOS software to perform ultra-high level digital processing in extreme environments. Size, weight, and I/O channel density are critical design requirements in many such embedded applications. By taking advantage of the extreme performance and small size of FPGA devices, CompactRIO is able to deliver unprecedented control and acquisition capabilities in a compact, rugged package with extreme industrial certifications and ratings for operation in harsh industrial environments. Temperature ranges of -40° to 70° C (-40° to 158° F), 50 g shock rating, and a variety of international safety, electromagnetic compatibility (EMC), and environmental certifications and ratings are all available with CompactRIO. 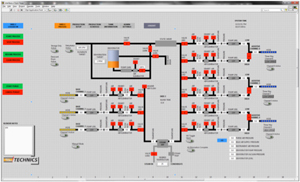 The LOGOS management system consists of integrated hardware and software for managing the plant operations. 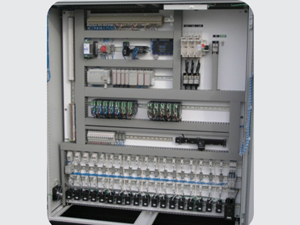 The system controls the Embedded I/O and PC’s in communication with the field devices such as the tank monitors and variable speed drives. LOGOS Machinery SCADA ensures that the simultaneous blending of multiple components is executed in exact accordance with the blend recipe. The system utilizes database tables which are shared with the LOGOS Enterprise. 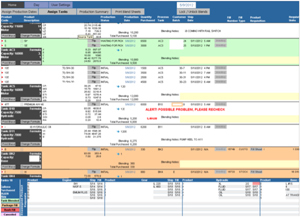 Any number of recipe spreadsheets can be stored on the enterprise system with only today’s production presented to the plant floor for processing. This provides a certain amount of administrator control. The second database set is maintained by LOGOS Tank Farm Module. 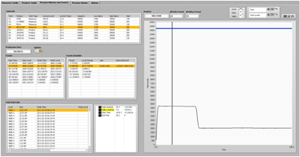 This module supervises the inventory of material connected to the process, its location, and other parameters. Bulk loading and unloading operations to trucks, rail, and barges is managed by the LOGOS Logistics System. This module interacts with the transfer platform and will generate reports for received inventory as well as custody transfer. Each of these events will be accompanied by data capture at the loading or unloading platform from devices such as scales and meters.